Alain Turenne, division vice president of corporate social responsibility and product integrity for Walgreens Co., presents at the Baumhart Center's 2017 Leadership Series. 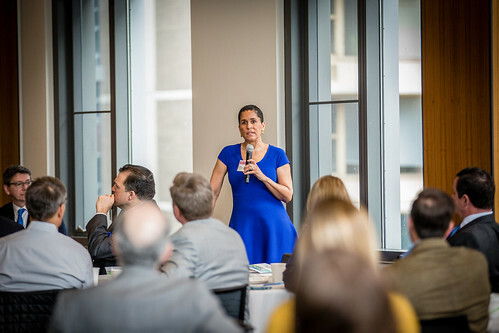 Corporate, government, and Loyola leaders headlined the inaugural Leading Business for Good speaker event hosted by the Baumhart Center for Social Enterprise and Responsibility. The Baumhart Center brings together top leaders to bridge the theory and practice of progressive social responsibility. Alain Turenne, Division Vice President of Corporate Social Responsibility and Product Integrity for Walgreen Company. John Caltagirone, Founding Director, Loyola Business Leadership Hub, and Kevin Stevens, Dean of the Loyola Quinlan School of Business, welcomed attendees and described Quinlan’s role in leading innovation, research and education in developing and supporting socially responsible business practices and market based strategies to resolve social and environmental issues. He suggests that Jesuit universities have long prepared men and women to enter this world with a moral compass, where the truth exists and can be discovered. Alain Turenne outlined Walgreens’ approach toward corporate social responsibility, touching on the corporation’s key goals, partnerships, and strategies. The final speaker, Lisa Morrison Butler, Commissioner of the Chicago Department of Family and Support Services (DFSS), challenged corporations to move beyond their mission to improve the lives of those they touch. View events photos in the gallery below or on Quinlan’s Flickr page. The Leading Business for Good leadership series will continue on August 1 and November 7, 2017. Event details will be announced on the Leadership Series event page. For more information or to partner with the Baumhart Center, contact Carolyn Ogrey at cogrey@luc.edu.